And lastly but most importantly, if you know your dog is likely to be stressed, panicked and struggling to cope on bonfire night, do not leave him/her alone. Even if this means you missing out on seeing fireworks at an event. 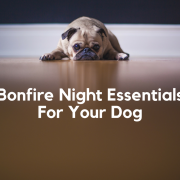 In my opinion, helping your dog to cope throughout bonfire night is more important. Once Sunday night has passed, if you would like guidance on how to RESOLVE the behaviour issue rather than MANAGE at the time of the event, then got n touch to arrange a home visit. It’s the time of year when fireworks will begin to occur over bonfire night, Christmas and New Years Eve; but is your dog likely to cope well during these times? If the answer is no then we need to help prepare them asap. 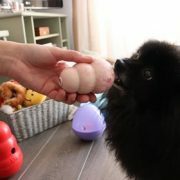 Create a situation where your dog is doing something positive such as playing with a toy or keeping busy with a bone. Play the sound of fireworks from your phone/laptop at a VERY LOW VOLUME with DISTANCE away from your dog. Play the sound in short bursts and always make sure your dog is not showing any signs of being unsettled. If your dog does become unsettled, turn off the sounds, take a break and help your dog to settle and relax again. Then try again but reduce the volume and move your mobile/laptop further away. Practice this daily for a few minutes, both during the day and in the evening to continue the desensitising process. Always make sure your dog has a positive experience from each training session. Whenever we do training with our dog, we need to make sure that we are aware of how our dog is feeling by getting feedback from them via their body language. Things like yawning, panting, excessive eye blinking, lip licking are some of the signs to look out for. If you’d like help putting the training sessions into practice, then give me a call to arrange a home visit. Next blog will be covering how to help your dog on the day of bonfire night. At Your Dog’s Pace, we provide a tailored service to meet the needs of you and your dog in Buckshaw Village, Leyland, Chorley and surrounding areas. We are fully insured and DBS checked.